The Redd on Salmon Street is a working hub for the regional food economy. We are advancing a more equitable, restorative, and delicious food system by providing a platform for innovative ideas to take hold, and a home for food entrepreneurs to flourish. By inspiring change and supporting a regenerative food economy, the Redd supports the growth of a robust food system throughout the Pacific Northwest. 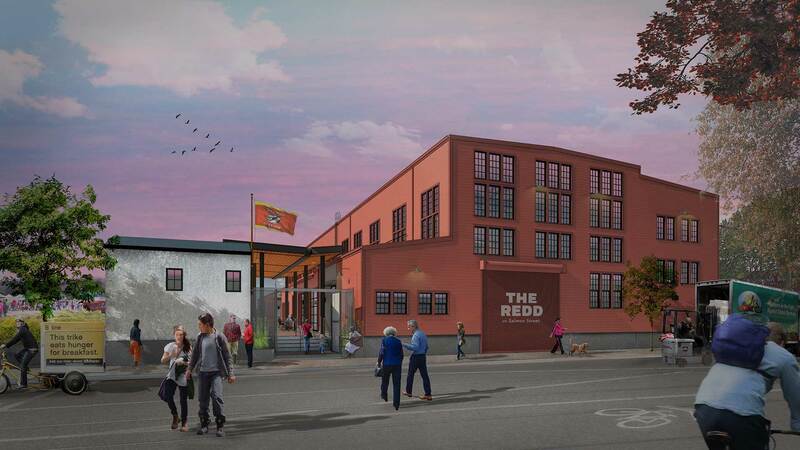 On two blocks in Portland's Central Eastside Industrial District, the Redd hosts both critical back-of-house support for socially conscious food businesses, and a world-class event center focused on spreading the ideas of the good food movement. The Redd is proud to be an Ecotrust project. We ate, we drank, we raised the roof at the Redd! Thank you for joining us this weekend to savor success and stoke the fires for the next chapter of the Redd on Salmon Street. From urban bike deliveries to school garden programs, to the freshest harvest from land and sea, the hub at Redd West embodies the hardworking spirit and agricultural roots of the neighborhood, while putting a new spin on innovation and accessibility. These enterprises are powered by local farmers, ranchers and fishermen, and are supported by our communities right here at home. Redd East’s uniquely industrial venue spaces have been restored with your inspired, forward-thinking vision in mind, blending just the right amount of historical charm with a bright, modern aesthetic. Take over the whole building for your larger-than-life festival, or celebrate a meaningful milestone with an intimate culinary class in the community kitchen. The sky’s the limit. Tucked into a vibrant, hard-working pocket of Portland's Central Eastside, the Redd on Salmon Street is a place where you can break bread, build connections, and ignite fresh thinking around a new food revolution that is equitable, prosperous, restorative, and delicious. Join us for multicultural food experiences, interactive exhibits, and culinary celebrations that form deep connections between people and place.